RTX 2070 same as overclocked GTX 1070? Discussion in 'Gaming (Software and Graphics Cards)' started by MiSJAH, Jan 31, 2019. Looking to upgrade from the laptop in my sig to a 2070 or 2080 laptop. I've only found one source with firestrike results for the new notebook GPUs. 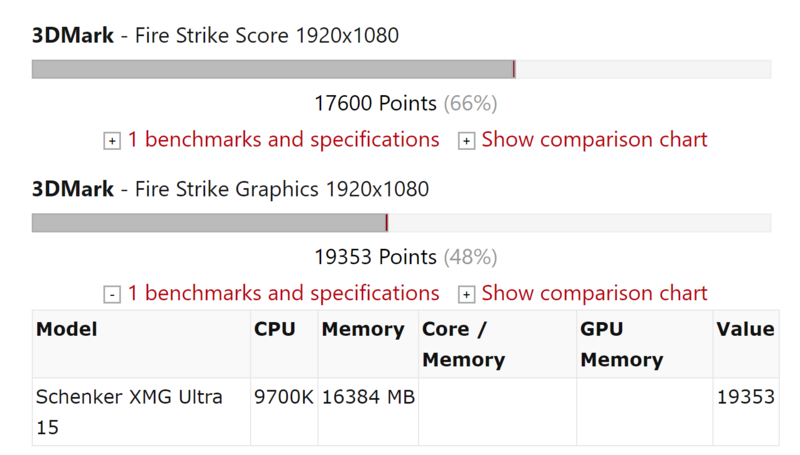 Am I right in thinking that the firestrike graphics score for this RTX 2070 is worse then the graphics score for my overclocked GTX 1070? Welcome any feedback from the community or other firestrike results for the new GPUs. Only gpu that i know that performs same as the desktop models is the alienware Area-51m. Not to mention the i9 cpu... lol, it looks like they did it. Where did you see the bench results for the Area-51m? Well, an overclocked 1070 was close to a stock 1080, so in a sense yes, the 2070 is like a 1080 or an overclocked 1070. The area 51 seemed nice when they revealed it, but the more info appears, the more... cautious I feel about it. Dannemand, Techdude594, MiSJAH and 1 other person like this. I may have been a little excited.. not sure what u guys make of geek bench. But... yeah.. I think or is very promising. Very much the same here. But I can still be excited. I'll wair till HIDEVO get ahold of theirs and start up the bench marks in depth. The geek bench was only with a 1080p screen thought. I would pass on rh3 4k and get a gsync. Windows 10 has to so much input lag it is a joke. Yeah right I don't trust this article at all. And the numbers seem wrong. Meh, just a marketing article claiming the fastest bestest again. Will wait for benchmarks from actual users and comparisons against actual users. I can't see any reason it would outperform a Clevo with a I9 and RTX 2080. They will obviously run the tests with the clevo on battery mode and show how much stronger the dell is with identical hardware. Dannemand, Techdude594 and MiSJAH like this. Hilarious, I'm strongly leaning towards the clevo. Options at present are the Alienware/Dell AREA 51M, the Asus ROG G703GX, or the Clevo (PCSpecialist OCTANE VI), I can get the Asus and the Clevo in budget, I've asked Dell to price match the configuration of the Clevo with 9700K, 16GB 2666, 2 x 500GB PCIe SSD, 144Hz 1080 display, RTX 2080, Win 10 Pro for £2,532. MSI GS65 2060 or 2070 max-q? jkq777, Apr 8, 2019, in forum: What Notebook Should I Buy?